I am once again interviewed by Chris Enns of the SSKTN network. "Show Me Your Mic" focuses on podcast hosts, their gear and setup. It's been over two years since I last joined Chris talking about Dr. Sci-Fi. This time we talk about Earl Grey and the Trek.fm network. In Earl Grey 82, "When in Doubt Choose Data," Char and Tristan emerged victorious in BridgeMates, the "how well do you know your cohost" game show. In this To The Journey/Earl Grey rossover, Phillip Gilfus reprises his role as game show host as once again Char and Tristan face off against Darren Moser and Daniel Proulx in a Voyager-style rematch. In this episode of The 602 Club, host Matthew Rushing is joined by Darren Moser and Norman C. Lao to discuss the Rocketeer. We discuss the comic and whether the movie is an improvement, our first experiences with the film, Joe Johnson learning from the masters on how to direct a homage to the serial, the story, the cast, the music and whether or not it still holds up. 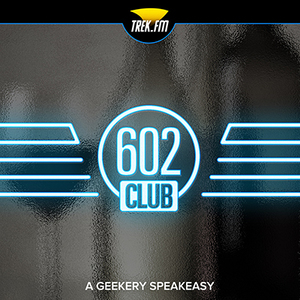 In this episode of The 602 Club, host Matthew Rushing is joined by Darren Moser and Norman Lao to talk about Marvel and Agents of S.H.I.E.L.D. Together we discuss the continuity the show shares with the films and the problems that causes, as well as the benefits. I show the world why the panel should be writing for television as they dig into the characters. I join @trekkieb47 @secretrangerfan & @TheCinemaSlob to talk about my time at Power Morphicon 4 where I hung out with the Ranger Command Power Hour crew. Met the true voice of Goldar and saved the day with In-N-Out burger. I join Aaron Gallo to talk about the 48th anniversary of Star Trek. We’ll also discuss recent Star Trek news and ask the Star Trek community if they would go into space if given the opportunity. I join Christopher Jones and my Earl Grey Co-hosts Phillip Gilfus & Daniel Proulx to discuss this unusual adventure, the telepathic capabilities of Vulcan, Romulans, and Betazoids, questionable Klingon fashion sense, and why you should be careful not to let comic stunt doubles wander into the frame. We cover WildStorm's four-part comic series The Killing Shadows. I join Christopher Jones on Warp Five to discuss one of my favorite Enterprise episodes, Dead Stop. In what is essentially a sequel to “Minefield,” the NX-01 puts in for repair at a mysterious facility that provides near-magical services for a bargain price. It also makes a mean plate of fried catfish. I join Christopher Jones, Mike Schindler, and Max Hegel in discussing one of my favorite TNG episodes, the "Die Hard in Space", Starship Mine. Chris and I also cover some weekly Trek news. I join Phillip Gilfus, Daniel Proulx, and Christopher Jones to discuss the antepenultimate episode of The Next Generation, “Emergence,” What Brannon Braga described as an attempt to create the ultimate holodeck story, and the tag-team PowerPoint prowess of Data and Geordi. I join the combined crew of the Earl Grey and To The Journey podcasts for a discussion of Q with a look at his appearances on Voyager. I join Christopher Jones and Tyler Johnson on Warp Five as they tap my Trek knowledge to discuss the Borg’s appearance on Enterprise, whether Picard should have cleaned up after himself in the Arctic so Archer wouldn’t have to. I join the crew of the Delta Quadrant Podcast as we review Latent Image from Star Trek: Voyager. I join Christopher Jones, Daniel Proulx, and Phillip Gilfus to discuss the fifth season Next Generation episode The Game. How Robin and Wesley make the perfect geek date, how the episode foreshadows technology addiction and the modern world of smartphone-gazing, the problem with Data’s off switch, why the crew is so happy to see Wesley back on the ship, and why Worf is so proud of his cake. I join Phillip Gilfus, Daniel Proulx, and Christopher Jones to find out why Picard envies Riker, how to roll up Klingon stereotypes and diversity into one episode, and why being lactose intolerant may not be a good condition to have when serving in the KDF. I join Charlynn Schmiedt, Christopher Jones, and Mike Rittenhouse to discuss The Q and the Grey, how the episode rewrites the very nature of the Q, and the battle for the future of the Continuum. I am interviewed by Chris Enns of the SSKTN network. "Show Me Your Mic" focuses on podcast hosts, their gear and setup. I was only a few episodes in to The Dr. Sci-Fi Show but wanted to talk about all of the thought I had placed into the how and why of the podcast.